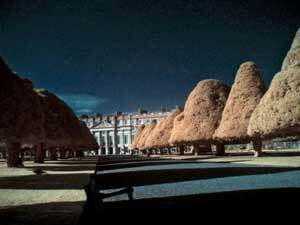 I first visited Hampton Court Palace in November of 1989. I’ve had a lifelong interest in Tudor history so Hampton Court was a logical place to spend a full day on my first ever trip to England. It was a trip I’d dreamed of taking for most of my life. 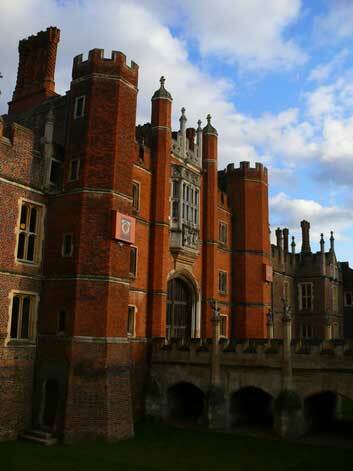 In fact, that entire first trip was planned as a “trek through Tudor England”, and Hampton Court was definitely going to be a priorty visit - one of many historical places that I’d read about over the years and had previously only dreamed of visiting. Allan, Holly and I arrived in East Molesey by train from London in the late morning of a perfect, sunny day with beautiful blue skies. 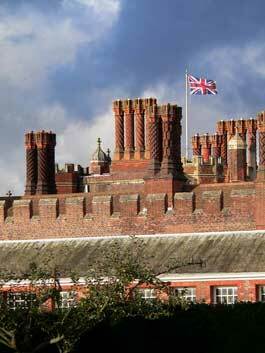 I can still remember my first view of Henry VIII’s beautiful red brick palace on the Thames with its dozens upon dozens of twisted chimneys. The palace turned out to be an amazing place to visit. I was NOT disappointed. Beautiful and elegant beyond anything I’d ever imagined and so steeped in history it literally took my breath away. 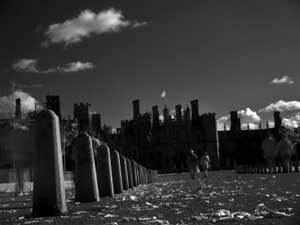 After acquiring the palace in 1525 as a “gift” from Cardinal Wolsey, who’d built it for himself, Henry VIII spent time there will all six of his wives. 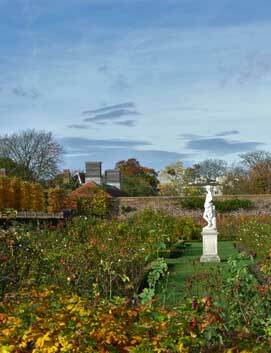 Henry’s long awaited son and heir, Edward VI, was born at the palace. A week or so later, Edward’s mother, and Henry’s fourth queen, Jane Seymour, died at the Palace of what was then known as childbed or puerperal fever. 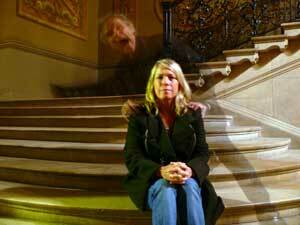 Her ghost has apparently been seen by many on various occasions over the years. 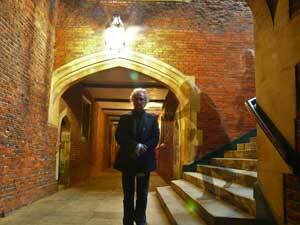 A ghost of another of Henry’s tragic wives is said to still frantically race through an area known as the Haunted Gallery outside the beautiful palace Chapel, screaming and begging Henry, who was praying in the chapel, to spare her life. Henry had discovered that Katherine Howard wasn’t as chaste as she’d led him to believe prior to their marriage and was possibly being unfaithful to him so he’d ordered that she be taken to the Tower of London, where she was subsequently beheaded. Holly was only 10 years old on our 1989 trip and since she was familiar with the story of Katherine Howard, we had to bribe her with a 10 pound note in order to get her to walk along the gallery with us in broad daylight! 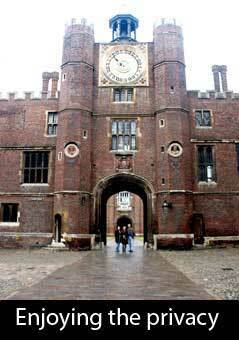 Henry VIII’s daughter by Ann Boleyn, Elizabeth I, also loved Hampton Court and spent a great deal of time there. Perhaps you can imagine then, my disbelief when in the mid-1990’s a friend showed me an article from the Travel Section of the Los Angeles Times. 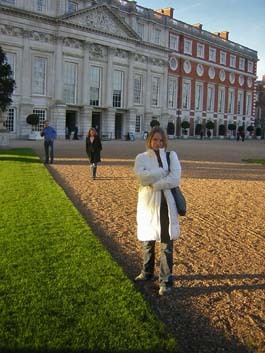 The article indicated that an organization called The Landmark Trust had arranged to furnish and rent two properties within Hampton Court Palace as short term holiday flats. According to the article, the smaller of these two properties, the Fish Court Apartment, had four bedrooms, a kitchen, formal dining room, living room and two full bathrooms. The price quoted per day (in the off season – late Fall through Winter) worked out to not much more than what we spent per night each time visited London and stayed in a nice hotel. I remember thinking that they surely must have dropped a “zero” in the prices and it couldn’t possibly be true. It had to be a typo or mistake of some sort. I promptly forgot about the article and visited London at least two more times over the next couple of years and stayed in nice, but certainly not historic, hotels. In 1999, lucky for me, I happened to pick up a copy of British Heritage magazine. In this particular issue there was an article written by a woman whose family had rented the Fish Court Apartment at Hampton Court for a week. The article described the apartment in detail she raved about what a unique vacation her family had experienced. She mentioned the price she’d paid to rent Fish Court and it was very much in line with what the Los Angeles Times had previously indicated. I just couldn’t believe it! Could it really be true? Since Allan and I would be celebrating our 25th wedding anniversary during 1999, I decided that at the very least I would make a phone call to check it out. I’m certainly glad that I did, because we ended up reserving the Fish Court Apartment for a four night Monday through Thursday stay in November of 1999 at the tail end of a 10 day London trip. We arrived at the Palace, very excited, on a cool November afternoon and were directed from the main trophy gates to “The Barrier”, where we were very warmly greeted by Palace security staff and given passes to carry at all times. Malcolm, one of the Palace’s security staff, walked us over to the Fish Court Apartment to show us around and familiarize us with the kitchen equipment, plumbing, smoke alarms, etc. His enthusiasm about the Palace really set the tone for our whole stay that first year. I just couldn’t believe it – while not particularly fancy in any way, the apartment was just wonderful, with old leaded glass windows and oak ceiling beams. 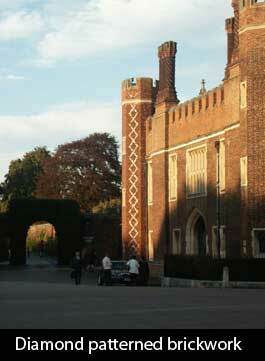 It’s in the Tudor Kitchens area of the Palace, which was built by Henry VIII in 1529. 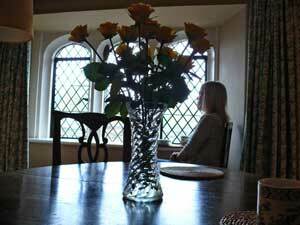 The flat itself is furnished with old, comfortable things and is very spacious and homey. 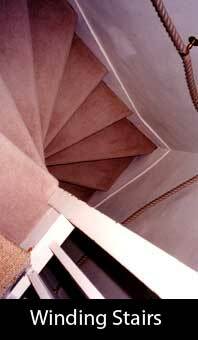 It’s on three levels with several sets of winding stairs to get from one level to the next. The kitchen was fully equipped with everything we could possibly need during our stay. 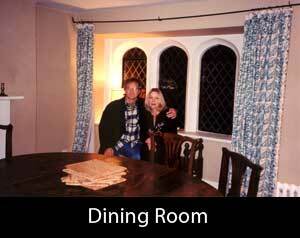 We could have cooked full meals there, although we didn’t. The beds were made up with clean sheets and fresh white towels had been placed at the end of each bed. Malcolm told us that our passes would enable us to visit the public areas of the palace without charge at any time during the regular opening hours. But more importantly, we were told that we were free to wander throughout the palace grounds and courtyards at any time during our stay - in the middle of the night, at the crack of dawn, whenever the fancy took us, as long as we stopped by the Barrier and notified the security staff so they’d know we were out there walking. And believe me, we took advantage of this! While the palace is truly amazing and beautiful during the day, to have the privilege of walking its grounds and courtyards late at night, entirely alone, is absolutely enchanting. If you squint a bit you can easily imagine that you have been transported magically back into Tudor times. 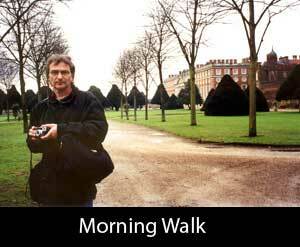 On these walks, we’d occasionally run into a security staff member doing his rounds, and once, on a dawn walk, we ran into the gentleman who runs Historic Royal Palaces, of which Hampton Court is a part, but mostly, we had the whole place to ourselves to wander around and ghost-hunt to our hearts’ content. I swear, it is like stepping into the pages of a history book. As close as I’ll ever come, I’m sure. Well, since that first visit in 1999, we’ve gone back every year since and spent a few days of our vacation at the Fish Court Apartment. The past three years, we’ve taken Holly along with us, because she loves it as much as we do. In August, 2004, are celebrating our 30th wedding anniversary and we (along with Holly) are going to be renting the Fish Court apartment for an entire week in September. Anticipating the trip is the shining beacon in my year of work drudgery!!! I can’t finish this without mentioning again the absolutely amazing and wonderful people who work at the palace on a daily basis. Every person we’ve encountered there (some of whom we’ve gotten to know better over the past five years), has been, without exception, warm, welcoming, friendly and extremely knowledgeable about the history of the palace. Every last person - security staff members - tour guides - warders - housekeeping staff – the manager (commissioner??) 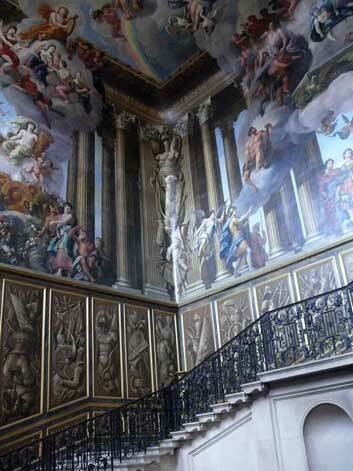 of Historic Royal Palaces, --- all have treated us absolutely beautifully and many have gone out of their way to make our yearly visits even more special and enjoyable. Two years ago we unlocked the flat door and walked upstairs to find vases of beautiful fresh roses placed in the dining room and living room. I just can’t heap enough praise on these fabulous people. They are always willing to share their love and knowledge of the palace with us. Trevor, Malcolm, Patrick, Joseph, George, Brian, Denise (and many, many others) we love you! Thank you from the bottoms of our hearts. 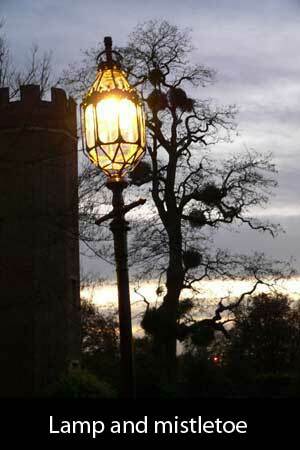 We are really looking forward to September and hoping that this time we’ll be fortunate enough encounter a ghost! I’d even pay a little extra for that!The photos in this section were taken on all our various trips. We’ll be sure to add a lot more after September. You can see other photos of the palace and its grounds in the “Surrey” section of our Vacation Photos area on this website. NOTE: I’ve written this “off the top of my head” on a hot, sunny, Southern California day. I apologize for any factual errors relating to the history of the Palace. 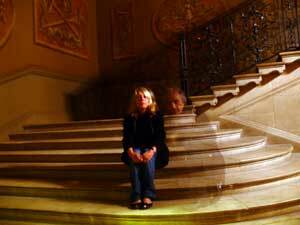 Well, with deep regret I admit that I still have not personally met a ghost (notwithstanding a strange "tucking-in" incident in 2003). I was hoping that our sixth time staying at the Palace would be the charm, but once again, I was bitterly disappointed! 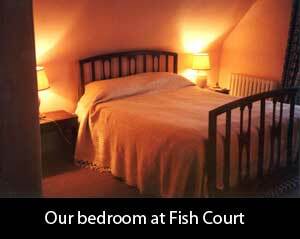 But our 2004 weeklong stay at the Fish Court Apartment was still a wonderful and magical part of our September vacation. 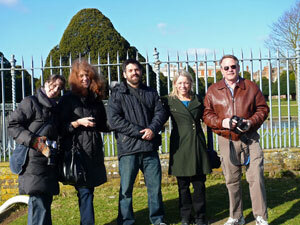 We reacquainted ourselves with old Palace friends and made a few new ones. Add Brian to the list of new and special friends. You’d think that having a neverending stream families stay a few days or a week at a time at the palace would cause a lot more work for the lovely people who work there, and I’m sure that it does, but you’d never know it by how you are treated. The only downside to our 2004 trip was that we didn’t have the unlimited access to the East Front Gardens of the palace during non-opening hours, which we’d always had on prior stays. 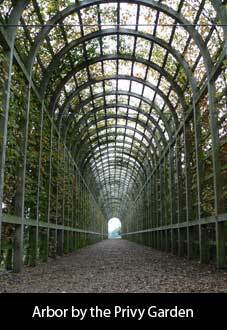 This is due to the fact that it is no longer free to visit the East gardens….access to that area is now included as part of the cost of admission to the palace, and therefore, it is locked off during hours when the palace is not open to the public. 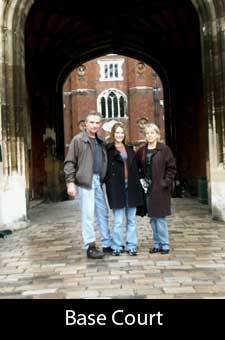 Some 2004 highlights: Spending time with Patrick and his family in Northamptonshire, dinner with Malcolm and Denise at Blubeckers, a very special palace tour conducted by Brian and having the security staff share grapes from Hampton Court’s great vine with us one evening when we returned from a day in London. And yes, regrettably I admit that I did actually set off the palace fire alarms on this last trip. I’d been so proud of myself for avoiding this particular mishap in prior years. We are always warned about the danger of setting off these very sensitive alarms. This time, I forgot one morning to close the kitchen door while making toast. I was absolutely mortified. But it was all cleared up with a phone call from Security, fortunately before the East Molesey Fire Department made an appearance. I still don’t know whether to believe Malcolm’s story that the bricked up wall behind which Edward VI’s nurse (Sybil Penn’s) spinning wheel was found was actually in the Fish Court apartment. Evidently, many people over the years had heard a whirring noise, and eventually when a wall was demolished, a bricked up room was found with the spinning wheel inside, purportedly spinning along all by itself. 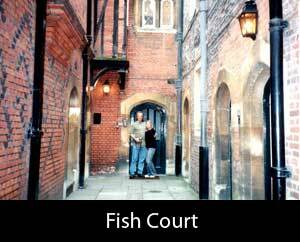 It’s possible that it WAS in Fish Court, since in the apartment entryway there is a bricked up, arched doorway. Pretty spooky. But then again, Malcolm might just be pulling my leg! 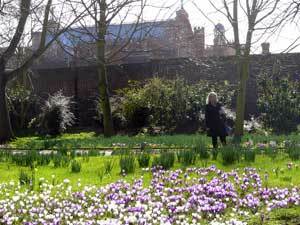 Hmmmmm….. well, we are scheduled for another trip to Hampton Court in about two months….perhaps seven times lucky? 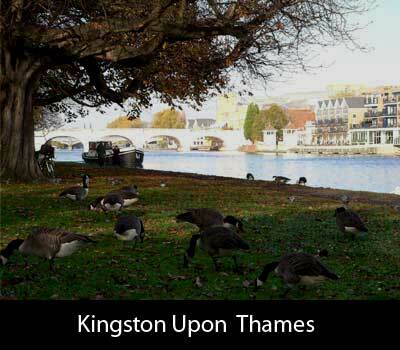 Allan swears that this time he’s going to take the river walk from the Palace all the way into Kingston-Upon-Thames, something he’s wanted to do each trip to take photos, but he never seems to find the time. 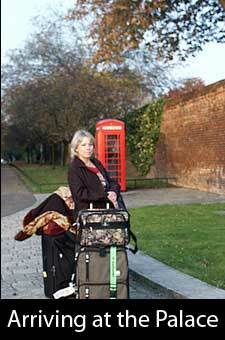 He says it is my fault – I always have a full agenda of places to go, people to see and things to do. Hard not to in this fabulous place. Update re November, 2005 Trip. 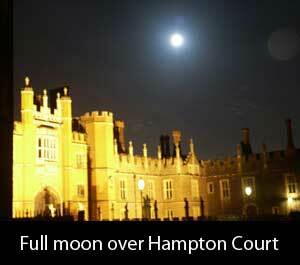 Well….our 7 th stay at Hampton Court and I still didn’t see a ghost, but Holly DID! Click here for her story about it. 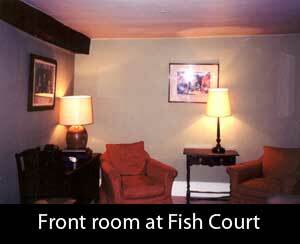 We still had a fabulous time on 2005’s Monday through Thursday stay at “our” beloved Fish Court apartment. We’ve really begun to think of it as our vacation home. 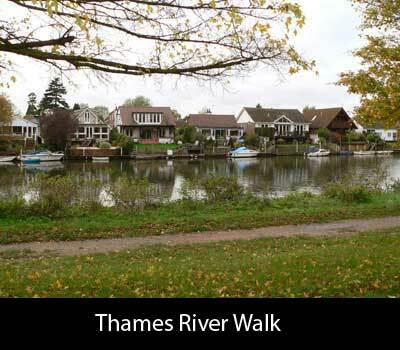 Allan finally got to take the long and much anticipated walk from Hampton Court to Kingston Upon Thames along the river. 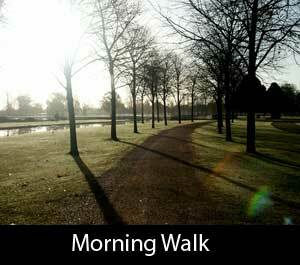 It was a pleasant day and a pretty walk – about three miles, I think. And there were multiple Boots Stores in Kingston beckoning to me and Holly….the carrot at the end of a stick! See the photos here. 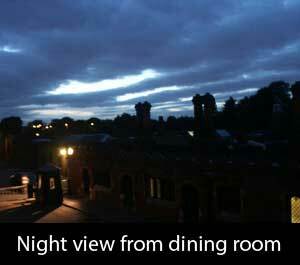 We enjoyed seeing and reacquainting ourselves with some of the Hampton Court Security staff – Patrick, Trevor, Malcolm, Denise, Brian and George. 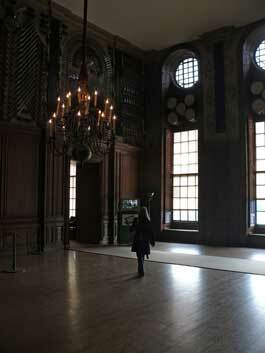 We were given a few very special tours of the palace. We were sorry that Joe W. was no longer there. He was one of the very knowledgeable warders and on prior trips used to feed us numerous little snippets of history that we’d not have known about otherwise. We’ll miss him on our future trips. 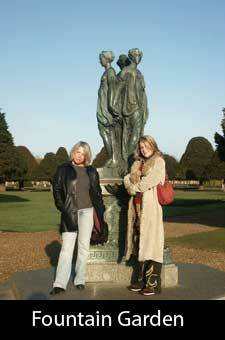 Patrick drove us to Chichester and Midhurst in Sussex on one of his days off. See the photos by clicking the links above.. It’s always nice to spend a day with Patrick and Holly and I finally got to visit The Spread Eagle in Midhurst – something we’d been wanting to do for years! 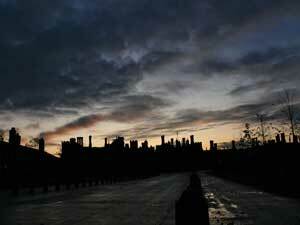 We had one of the most spectacular sunsets we’d ever seen in England the day we arrived at the palace. 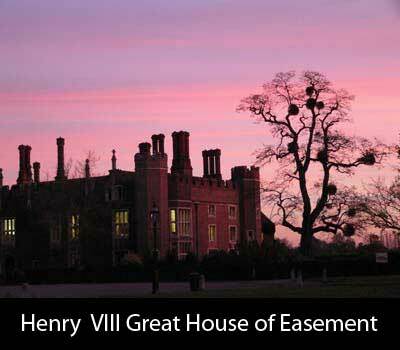 The vivid pink color of the sky seemed to last for about two hours, and there was a gorgeous array of mistletoe in a huge tree next to Henry VIII’s Great House of Easement. Here are a few photos. 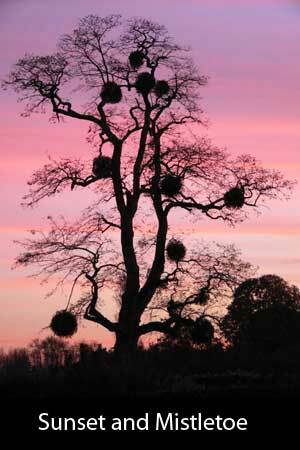 Allan must have taken 100 photos of this tree. He just couldn’t stop! (Good thing we were using a digital camera and didn’t have to pay to develop them all!) See more of these photos here. Only downside to this year’s trip, same as last year – we couldn’t get out onto the East Front of the palace very early in the mornings like we used to do….except for one day we were allowed out there with the gardeners. 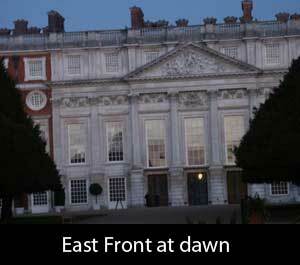 This is the one thing I miss under the new Palace rules – we used to get some of our very best photos at dawn on the East Front. 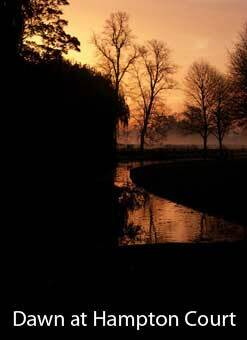 The sun coming up behind the yew trees and reflecting off the Long Water is a spectacular sight at dawn. Well be back for our 2006 trip in about two months. It’s MY turn to see a ghost! 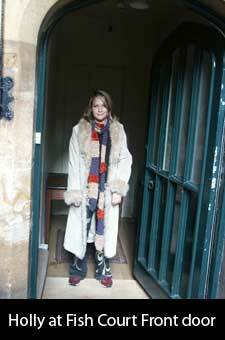 Our 2006 trip was lots of fun. Allan and I and Holly and Holly’s boyfriend (now fiancé), Paul, staggered our UK trips and overlapped in the middle at Hampton Court. Holly joined us for all four of our nights at the palace and Paul joined up with us for just our last night at the palace. It was lovely to be able to share that special place with him. 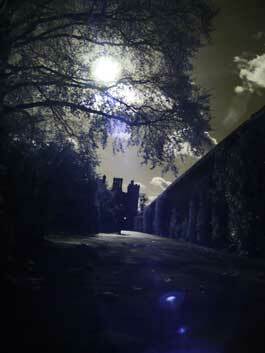 We had a blast posing our own ghost photos using time lapse photography in the palace courtyards late at night. 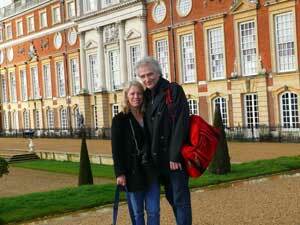 Paul arrived on what was probably one of the most beautiful days we’d ever seen at Hampton Court. It was late afternoon and the sunlight had the most spectacular golden quality to it and the light and shadows on the East Front were breathtaking. I still didn’t see a ghost but I’m not ready to stop looking! 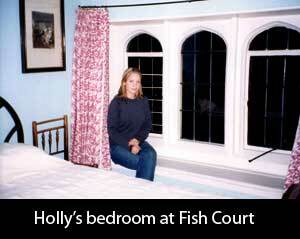 On our 2007 trip, Holly’s friends, Becca and Michael, joined us overnight one night at Fish Court. 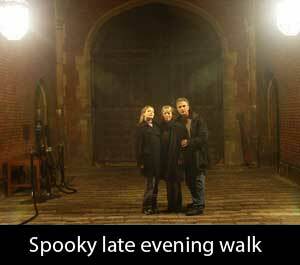 We did some more night photo shoots with time lapse and had a great time – fueled with a few pints at one of the local East Molesey pubs. It was wonderful to spend some time catching up with our palace friends – Trevor, Patrick and Malcolm (unfortunately we missed seeing Denise this time) – and it was fantastic to have Brian back. He’d been on leave during our 2006 trip and we’d missed him. 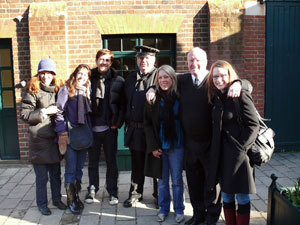 We also finally met Ian, an extremely knowledgeable palace warder and the “keeper of the ghost lore”. 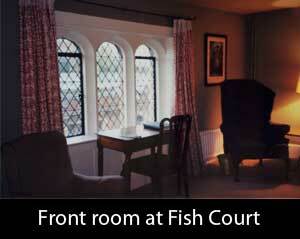 He came to the Fish Court flat and showed us a wonderful slide show he’d put together on the palace ghosts. And this time, I DID see something out of the corner of my eye very late one night while out walking in the deserted courtyards. A quick flash of movement where none should have been. It was only a just a brief flash, but it was most definitely there. And then Allan had a similar experience the next night. 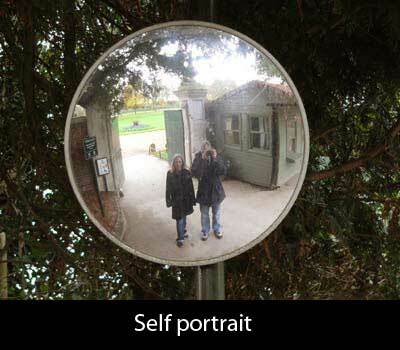 Perhaps those ghosts are getting used to our yearly visits and becoming more apt to show themselves. 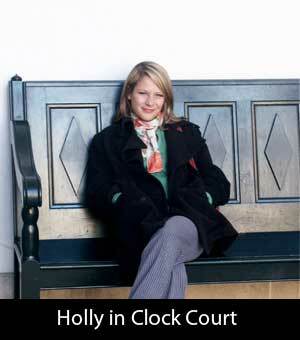 We will not be visiting HCP in 2008 because Holly and Paul are getting married at Conwy Castle in North Wales in March of 2009. Therefore, we’ll be delaying our yearly Hampton Court trip to make it a very special part of their pre-wedding celebrations. 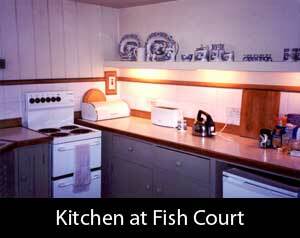 We have our beloved Fish Court flat booked for not just four nights, but an entire week (yeah!!!! ), just prior to the wedding. We’ve planned lots of activities and are very excited about seeing all our palace friends again. 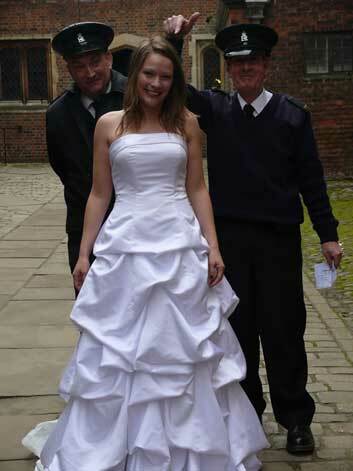 The wedding trip in March of 2009 was amazing. Allan and I stayed at Fish Court for an entire week prior to the wedding in Wales, and we were joined the last three days by Holly and Paul, along with Paul’s Dad, Bruce and brother, Jeff. 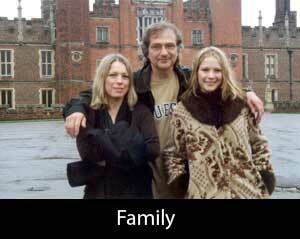 Paul’s Mom, Donna and sister, Emily stayed just outside the gates at the Kings Arms, but were given passes to come and go freely at the palace. 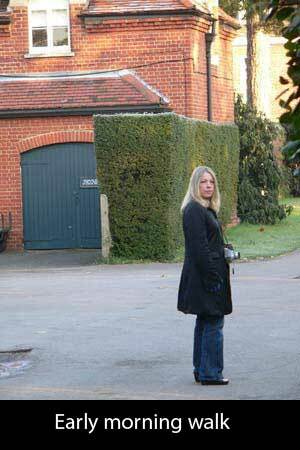 I think the highlight of this particular trip was the morning we all got up early and Holly put on her wedding gown (making sure Paul didn’t see it) and we ran around the courtyards before they opened to the public, snapping photos like crazy. 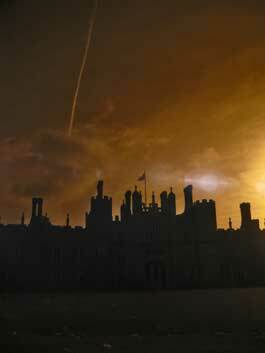 We heard later that one of the palace Tudor Cooks who saw us reported to Security that some pretty lady was out running around the courtyards in a ball gown! 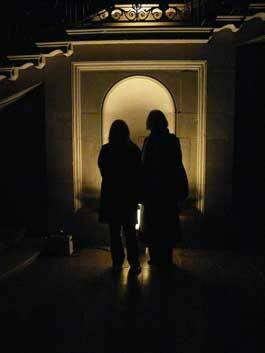 We had some very special access on this trip thanks to several friends – including a spooky, late night tour of the palace. We also saw the Wilderness Area in a whole new way – it was a carpet of flowers and looked totally different from how we normally see it. The only downside on this trip was that Base Court was in the process of being paved and we couldn’t get out there until the last day. 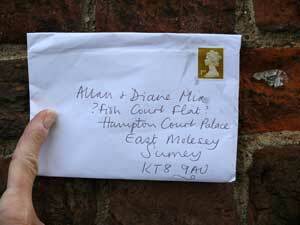 Many thanks to all our palace friends for helping to make Holly and Paul’s special wedding trip even better. Well, since we had gotten a bit “off schedule” by delaying our 2008 trip until spring of 2009, Allan and I decided to get back on track by going back to England in the fall of 2009 for just a week, including four nights at Fish Court. We arrived earlier than we should have on the Monday afternoon and had to leave our luggage with custody, but were given a pass to go about the palace – just couldn’t get into the flat until 4 pm. The sunlight and the clouds were wonderful that afternoon and we got some of the best photos of any trip, including many more of Allan’s favorite mistletoe-laden tree by the Great House of Easement. 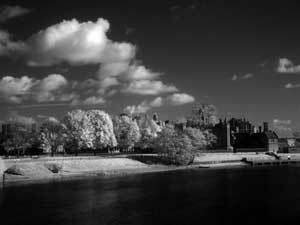 We’d bought an IR filter and Allan had a great time taking a lot of IR shots. He also managed to get some great dawn silhouette photos of the palace, as well as some terrific “ghost” shots of us in the Queen’s Staircase late one night. Once again, we had a lot of good times hanging out with old and new palace friends. 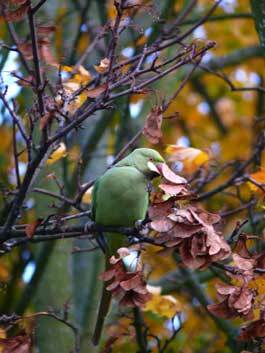 We also saw the Hampton Court parrots for the first time. Now we can’t imagine how we’d ever missed them! 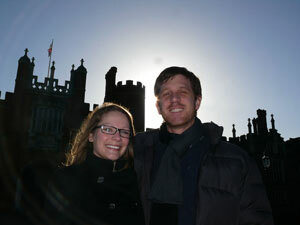 Many thanks to Patrick, who has become a good friend over the many years we’ve been visiting Hampton Court. He always manages to show us something we’d not have known about otherwise. 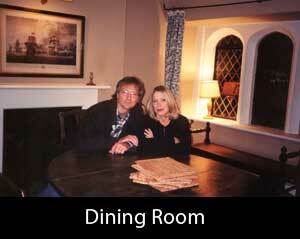 We returned once again in Fall 2010 for our usual four nights. We missed having Holly and Paul along, and we really missed baby Rhys, who was only six months old. We’d hoped to bring him on this trip, but it didn’t pan out. He will be joining us along with his Mom and Dad this fall and we can’t wait to introduce him to this family tradition of spending a few days each year in wonderful, historic, Hampton Court. We hope he will learn to love it as much as we all do and I think that will most likely happen! We got better acquainted with some of the custody staff we’d met the year before – Kevin, Derek, and Kenny, and spent some time with Ian, one of our good warder friends, who showed us some great 17th century graffiti we’d never have found on our own! 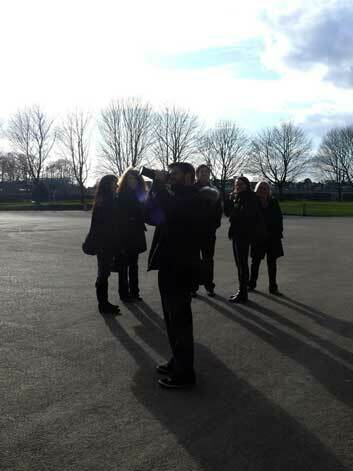 We also spent some time with the fantastic Trevor who always manages to show us something special! And Roly invited us to share pancakes at break time. Always a treat! Our friends, Tony and Sidonie who live in St. Leonards on Sea came to join us for our first night at the palace and spent the night – we gave them the haunted room. What a fantastic time we had! They are coming back to visit us at the palace again this fall. We missed seeing Johnny Depp by only one day, as he had been filming scenes for the latest Pirates movie just the day before our arrival. 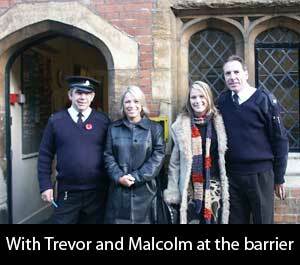 On future trips we will miss custody supervisor, Brian, who has recently retired.